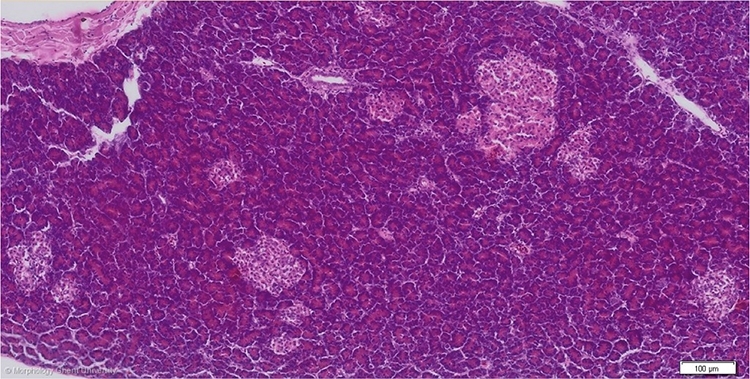 The islets of Langerhans (insulae pancreatis) of the endocrine pancreas can be divided in alpha, beta and mixed islets according to their cellular composition and size. Alpha islets are dark, have the largest diameter and are composed of alpha (Î±, A ) cells and delta (Î´, D ) cells whereas beta islets are paler and composed of beta (Î², B ) cells and a few delta cells. Mixed islets contain all cell types. Mixed islets are present in poultry but do not occur in all avian species. Alpha cells secrete glucagon, beta cells secrete insulin and delta cells somatostatin.